Cessna pilot Michael Trapp didn’t schedule a crash of his plane into Lake Huron seventeen miles from Harbor Beach, Michigan. He also didn’t put on his schedule an eighteen hour life lesson in perseverance. The swimming lesson was a bonus. But when the Cessna sinks 190 feet to the bottom of Lake Huron in less than twenty minutes, sink or swim takes on an urgent meaning. The Google calendar doesn’t send an email informing you that there’s a slobberknocker on your schedule. Keep treading and watching the stars. It’s the best, most succinct advice for maintaining an unbroken spirit. 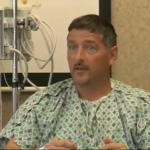 Michael Trapp described from his hospital bed how he tried to swim to shore. He got to within a mile. The current was the strongest at shore, too much for him. 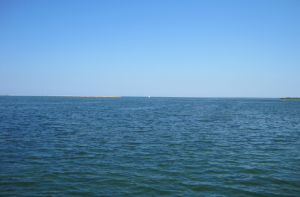 I took the picture of Lake Huron from shore of Harbor Beach when writing a review of Steven Pressfield’s Do the Work. I stood at the location Michael Trapp was trying to reach. He was that close to the finish line before the current threw him back with more emotional and physical anguish. At the end, he waved his white sock to rescuers with the last of his strength, his eyelids barely able to stay open. He made it across the finish line. He beat back all the resistance man and Mother Nature could throw at him, trying to get him to raise the white sock as a flag of surrender, and then sink like his Cessna to the graveyard at the bottom of Lake Huron. I wonder if Michael Trapp read Laura Hillenbrand’s Unbroken, another book I thought of as I heard of his story. In Do the Work, Pressfield writes that “Resistance is a repelling force. It’s negative. Its aim is to shove us away, distract us, prevent us from doing our work.” It’s also strongest at the finish line, like the current at Harbor Beach. Just keep treading and looking at the stars.